ITALIAN MASTERS DO IT BETTER will present these masters to the general public at art galleries, art fairs, museums, private and public institutions, as well as through media campaigns and publications. 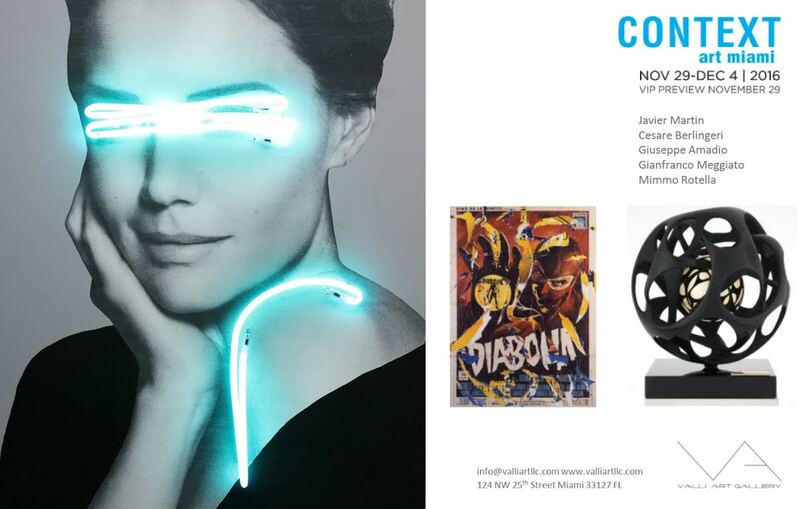 This unique exhibition will open at VALLI ART Gallery simultaneously with our Booth at the prestigious CONTEXT Art Fair, both in Wynwood, FL. Movement, with Gillo Dorfles, Gianni Monnet and Atanasio Soldati. The movement was a worldwide catalyst of Italian abstract instances proposing a synthesis of the arts, able to combine traditional painting with new communication tools, to show to industrialists and artists-artists the possible convergence between art and technique. In 1947, Munari created Concave-convex, one of the first installations in art history. Lucio Fontana presented Black environment, 1949, at Galleria Naviglio in Milan. Between December 1959 and July 1960, Enrico Castellani, Extended and bent inwards surfaces, and Piero Manzoni, Achrome, founded Galleria Azimut in Milan, followed by the journal Azimuth in collaboration with Agostino Bonalumi, Cushioned-canvases. Azimut and Azimuth had an echo and domino effect almost unimaginable, with a disruptive experimentation and a desecration of the tools of making art, offering to the spectator the new role of completing the work by an artist that conceptually, symbolically and physically, violated the canvas. In those same years, Paolo Scheggi reached similar artistic outcomes exhibiting his Intersurfaces in Florence. In 1965, Fontana involved Turi Simeti in the exhibit Zero Avantgarde at his Milanese studio, proving that the Sicilian artist wasn't indifferent to the demands of the Spatialism. The exhibit makes a synthesis of two historical Italian movements with Alberto Biasi telling about Optical Art and with Castellani, Bonalumi and Scheggi about Spatialism. The show, following Azimut's assumptions, investigates these artists, including their natural heirs, Giuseppe Amadio and Cesare Berlingeri, who dared to violate the canvas to rewrite history, building on it something unexpected and revolutionary based on the real use of space, the research on time and the analysis of the structures' rhythm. A section of the show will present Mimmo Rotella and Giosetta Fioroni that in the same years explored at Rome POP expression and realistic Nouveaux. Including Michelangelo Pistoletto, the exhibition showcases masters and their followers that made Italian painting a center of autonomous visual perceptions, where viewers also became the protagonists of the canvas interpretation.